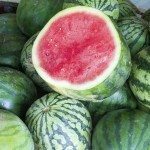 Cultivated as far back as 4,000 years ago in ancient Egypt, watermelons originally hail from Africa. As such, this large fruit needs warm temperatures and a long growing season. In fact, the finicky watermelon requires not only optimal temps but specific conditions for premium production, including proper watermelon plant spacing. So what is the correct way to space this melon? Read on to find out. Why Put Distance Between Watermelon Plants? Just as an architect doesn’t just begin building without a plat and a blueprint, gardeners usually map out the garden plot prior to planting. It’s important to consider where to plant certain plants in relation to other plants, taking into account their different or shared water requirements and sun exposure as well as their mature size. In the case of spacing watermelon plants, those set too far apart waste valuable garden space while those set too close together compete for light, air and soil nutrients, resulting in a potentially compromised crop. When planning watermelon plant spacing, it really depends on the variety. For the most part, allow about 3 feet in distance for small bushing type watermelons or up to 12 feet for giant ramblers. 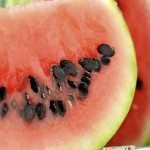 General guidelines for common varieties of watermelon are to plant three seeds 1 inch deep in hills that are spaced 4 feet apart, and allowing 6 feet between rows. Most watermelons weigh between 18-25 pounds, but the world’s record is 291 pounds. I rather doubt you will be attempting to break the world record, but if so, plant accordingly with plenty of space between watermelons. These melons grow on long vines, so keep in mind that space between watermelons will be considerable. Watermelons thrive in deep, sandy loam rich in organic matter and well-draining and slightly acidic. This is because these sandy loam soils warm more quickly in the spring. Also, the sandy soil allows for the deep root growth that constitutes a watermelon plant. Don’t attempt to plant these heat lovers until all danger of frost is past and soil temps are at least 65 degrees F. (18 C.). You may want to use floating row covers or hot caps as well or mulch with black plastic to retain soil moisture and heat. Thin when two or three leaves emerge on the seedlings. Keep the area around the melon free of weeds and water if there is an extended dry period. Watermelons have a very long tap root and don’t usually need lots of extra water, though they certainly respond well when given plenty to drink, especially when fruiting.